One of our WSA Members has some questions about possible unionization efforts around his company. If you have experience with company unionization, please let us know. We have received questions about the recent Walmart awards. Specifically, if a contractor has been sweeping a Walmart location for a third party – but now won it as a direct account – does this violate a non-compete about not contacting accounts that are currently under agreement with that third party? Unfortunately, since non-compete agreements vary among third parties and, potentially, there may be variance in what is allowable under individual state laws, we cannot venture what might well be considered a legal opinion. We can only suggest that if you have such questions you contact a local business attorney about the specific wording in your contract, given the statutes in your state. However, if you are told by a third party vendor that you have violated its non-compete because you won a direct Walmart contract at a location where you previously worked for the third party vendor that lost it, please let us know. BambooHR boasts over 13,000 users of its HR software package. The company recently offered a free white paper entitled “HR Best Practices that Improve Engagement.” I thought you might glean some information of value from the presentation information. Even though some of the information is clearly designed for large organizations, I found it interesting to see the stats the white paper offered in terms of employee preferences. 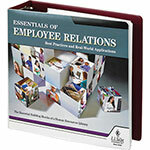 On a similar topic, J.J. Keller is offering its “Essentials of Employee Relations” manual, which is a 500+ page manual that “takes you through all aspects of the employer-employee relationship” for free through April 29th. The hope is you will sign up for their yearly update service. April is Distracted Driving Awareness Month. The National Highway Traffic Safety Administration reports that, in 2016, distracted drivers caused 3,450 fatalities and 391,000 injuries on America’s roads and highways. That’s at least 9 people killed and 1,000 injured every day. If you want more info on this topic in order to do a safety presentation to your Team, here is a link to the Keep Trucking Safe blog, sponsored by the State of Washington. Or, go here for access to free posters, videos, fact sheets and more on the National Safety Council website. Spring Creates Upswing in Incidents — Focus! As always, if you have questions or comments about this WSA Member Update or anything else to do with the World Sweeping Association or power sweeping in general, please be sure to send me an email or call on my direct line, 360.724.7355.